NEW JUNE 2018 !! Pucklechurch, Bristol No.11 Balloon Centre. NEW JULY 2018 !! Arming Balloon Barrage Personnel in 1940. JUNE 2018 POLICY REGARDING RESTORATION OF STATIC BALLOON BARRAGES AUGUST 1944. NEW Linda Hervieux and her new book "Forgotten" about an African-American Balloon Unit on D-day. Join the Airship Heritage Trust if you enjoy finding out about "Lighter Than Air" matters. Wanted: Barrage Balloon or any items associated with Barrage Balloons. 100483 Wing Commander Henry Rapoport Rollin M.B., B.Ch., D.P.M. Ex-Balloon Operators Meet up for their Annual Dinner 2012. 354025 WO1 Francis Frew DUNLOP M.B.E. New Book Announcement: Stitching for Victory by Suzanne Griffiths Updated!! 853747 LAC Leonard Ashcroft Bancroft Archive 919 Sqdn Updated!! HENRY BENJAMIN BANKS.901 Squadron.....Can you help Felicia Riley?? Roof Over Britain -published in 1943 as a public information booklet. Aubrey Irving Moore 11155265 and Balloon Painting by Peter Wilson. Former Comrades - LAC Purser Bush, Sqdns. 901, 948, 982 and 966. Edgar Garwood and Stanley Jay 980 Sqdn. Edna Joyce Mann 904/5 Squdn, John Leslie Pickett 906 / 978 Sqdn. 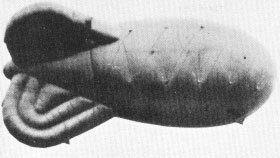 History of Balloons in Warfare - the earliest uses of balloons in warfare. Hanna Reitsch - A German WWII test pilot who has been called "The Century’s Greatest Pilot"
WWII Valentine Card with "Balloon Barrage"
Acting Squadron Officer Diana Mary BARTON OBE. Tom Flack Interview and Photographs and The Balloon Hangar at Pawlett, Somerset.